The LUCID HD7 Red Dot Sight is a third generation optic that offers beneficial specs and features that exceed some market standards. We will be reviewing those specs and features to see if this popular sight is right for you. 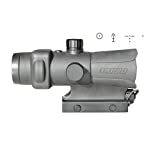 This sight is a popular model of rifle scope that receives fairly high ratings in online consumer reviews. The rifle accessory is crafted with an aluminum frame and durable rubber which marks it as a great, parralax-free co-witness in the lower 1/3 of fast target acquisition and accuracy. Weighing in at 13 ounces, this unit has dimensions of 5.5 x 2.8 x 3.5 inches. It requires one AAA battery to function for over 1000 hours of battery life. This scope includes four selectable reticles based on 2MOA to assist with aiming. Two modes of operation exist for the reticle brightness: automatic and manual. The LUCID HD7 Red Dot Sight is a quick and simple way to get windage and elevation adjustments zeroed to the rifle it is attached to. The LUCID HD7 is shock resistant as well as fogproof and waterproof. An attachable 2x magnifier, 1.5x magnifier, kill flash filter, and quick detach kit are all custom made to fit this red dot sight, though sold separately. Some covers and accessories from other companies may not have the correct measurements to fit it perfectly, so be aware when shopping around. It comes with a lifetime warranty, as is standard of LUCID products. The LUCID HD7 will attach to any picatinny rail, as it has a specific mount built in already. As the product is made in China, it is cheaper than similar items produced in America. This makes some buyers nervous, however the company that designs the optic is American, and the quality shows through, according to many reviews. The third generation sight has made base improvements from other models, proving to be fairly popular. The auto-brightness is reported to work adequately and zeroing is pretty easy. The product has been called accurate, intuitive, and durable by many owners. The accuracy, high ratings, and customer satisfaction of owning a third generation red dot sight is available for a decent price. It is even easy to install and lasts quite a while thanks to its high battery life. Turrets respond precisely with this sight. Need of adjustments can happen before the sight can be used to satisfaction, but rifle owners should have little to no problem with these adjustments, which are mostly personal preferences. The LUCID HD7 Red Dot Sight offers capability similar to other optics that are far more expensive. By saving money buying this product, buyers can also consider purchasing accessories to go along with this scope.